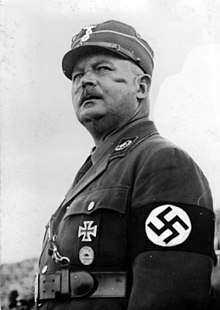 Ernst Julius Röhm (28 November 1887 in Munich – 1 July 1934 in Munich) was a leader and co-founder of the German Sturmabteilung, the Stormtroopers. He also was a member of the German Reichstag, where he was a minister from 1933 to 1934. He was murdered during the Night of the Long Knives, in 1934. Adolf Hitler gave the order to murder Röhm. During the First World War, Röhm fought as an officer. He was awarded the Iron Cross First Class. Ernst Röhm was born in Munich on 28 November 1887. He was the third child of a chief train inspector, Julius Röhm, and his wife, Emilie Röhm. He had one older brother and one older sister. His sister's son was Bernhard Lippert, a German diplomat. In 1906, after his Abitur (school exams) in Munich, Röhm joined the Bavarian army as a Fanjunkare. Two years later he became a Lieutenant. In 1914, at the beginning of the First World War, he was an adjutant and fought on the Western Front. He was wounded three times, and was awarded the Iron Cross First Class. He was badly hurt in that year and lost a piece of his nasal bone. He worked for the Bavarian government in the War Department for the first time. Two years later, in 1918, he was given the rank of a captain (German: Hauptmann). After the First World War, Röhm went to the Freikorps (Free Corps) of Franz Ritter von Epp. He wanted to fight against the Communists in Munich. With this group, he went to fight against the Bavarian Soviet Republic. In July 1919, the Freikorps became part of the Reichswehr. In 1919, Röhm joined the German Workers' Party (German: Deutsche Arbeiter Partei (DAP)). This was the precursor of the Nazi party. One year later, he became a member of the German Nazi Party. He received the membership number 623. Röhm helped Hitler establish relationships with the Bavarian politicians and the industrialists. Two years later, Röhm and Hitler started the Sturmabteilung (SA), attracting many men from the Freikorps. It was founded as a paramilitary group for the German Nazi Party. Hitler made Röhm the leader of the SA. Röhm took a part in the Beer Hall Putsch in 1923. The Nazi Party tried to overthrow the government, but failed. Röhm was arrested and charged with high treason. The judges decided he was guilty on 1 April 1924. Röhm went to prison for five months and lost his job in the army. Following the court trial, both the Nazi Party and the Sturmabteilung became illegal. In 1924, Röhm helped start the Frontbann, an alternative to the Sturmabteilung. After an argument with Adolf Hitler, Röhm retired as leader of the SA. He said that he was only a soldier and not a politician. Between 1928 and 1930, he worked for the Bolivian military as an advisor. On 1 November 1930, he went back to Germany and joined the Nazi Party a second time. 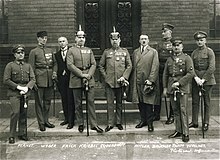 In January 1931, Adolf Hitler placed Röhm in charge of the Sturmabteilung. In just over a year, he expanded it from 70,000 to 170,000 members. In April 1932, Chancellor Heinrich Brüning banned the SA again. Franz von Papen, who was chancellor after Heinrich Brüning, annulled the ban in June. In 1933, Ernst Röhm became a Reichsminister, a minister of the Reichstag. In 1934, the SA had over 4,500,000 members. The power of the SA increased. Because of this, Adolf Hitler and the Schutzstaffel (SS) started a new dispute with Röhm. The SA was about 20 times greater in membership than the Reichswehr; Röhm was dreaming to take over the Reichswehr. Hitler was afraid of Röhm's power. Röhm wanted to merge the Sturmabteilung with the general army, with him as leader. He also wanted a "second Nazi revolution" to make Germany more socialist. He was an anticapitalist, and at this time, Hitler was trying to befriend Germany's industrialists. Hitler planned to kill Röhm. Röhm arranged with Hitler that the Sturmabteilung would get four weeks holiday during the summer of 1934. The holiday started on 1 July 1934. Röhm wanted to go to Bad Wiessee for rest. On 29 June 1934, Röhm was arrested, yet had no trial. He was given the choice by Theodor Eicke: to commit suicide or be killed. On 1 July, Theodor Eicke shot Röhm as instructed by Hitler. Röhm was buried in the Munich western cemetery. Many Sturmabteilung leaders were killed on that same night, mostly by the Schutzstaffel and Gestapo. It was called the "Night of the Long Knives". The next day the German parliament passed a law with only one paragraph making the murders at the Night of the Long Knives legal. ↑ "Biography of Röhm by the Jewish Virtual Library". jewishvirtuallibrary.org. Retrieved 2009-04-13. ↑ 2.0 2.1 2.2 2.3 2.4 2.5 "Röhms biography in table form" (in German). dhm.de. Retrieved 2009-04-13. ↑ 3.0 3.1 "A biography of Ernst Röhm in German" (in German). nationalsozialismus.de. Retrieved 2009-04-14. ↑ Carlos CaballeroJurado (2001). The German Freikorps 1918-1923. Oxford: Osprey Publishing Ltd. p. 25. ISBN 1-84176-1842. ↑ Joachim C. Fest (2005). Hitler. Eine Biographie. Ullstein Tb. p. 204. ISBN 978-3-548-26514-8. ↑ "The SA". Britannica Online Encyclopaedia. Retrieved 2009-04-13. ↑ "The biographies of important leaders of the German NSDAP - Röhm's biography" (in German). Cuk Anton. Retrieved 2009-04-13. ↑ Heinz Höhme. 'Der Orden unter dem Totenkopf - Die Geschichte der SS. Weltbild-Verlag. p. 26. ↑ "Biography of Ernst Röhm" (in German). Meyers Online Lexikon. Retrieved 2009-04-13. ↑ 11.0 11.1 "Röhms biography". Spartacus Schoolnet. Retrieved 2009-04-13. ↑ "Short Biography" (in German). Dieter Wunderlich. Retrieved 2009-04-13. ↑ ""SA"". Britannica Online Encyclopaedia. Retrieved 2009-04-13. ↑ Jan Kershaw (1998). Hitler band 1. Stuttgart. p. 659. ISBN 3-421-05131-3. Wikimedia Commons has media related to Ernst Röhm. All ministers were NSDAP members except where indicated ("ind" = nominally independent). Most of them became later also NSDAP members, except Von Papen, Hugenberg and Von Eltz-Rübenach. This page was last changed on 19 November 2018, at 16:01.